Down & Dirty: Is it really stealing? As I walked through the park today I noticed I was stepping on dark blue/black berries. Couldn't be Amalanchier, couldn't be blueberries. Looking up I realized we are smack dab in the middle of black cherry season, and being a well-prepared forager, I reached into my backpack for a plastic bag. Prunus serotina is the largest cherry native to eastern North America. 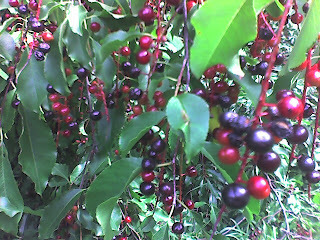 It's easily confused with Prunus virginianus (aka chokecherry), although P. virginianus is a smaller, scrubbier tree. Black cherry grows wild in woods all over the east. Its bark is used medicinally, the wood of larger specimens is valued for woodworking, and the fruit is delish. Black cherries hang in loose clusters of 10 - 15 fruits, which don't all ripen at the same time. Red fruit isn't ripe; wait till it turns black and practically falls off its stem. Of course even the ripest choke- cherries are so sour they'll make you pucker up tight, and the seed is large-ish, so these aren't the best munch-as- you-go fruit. But the juice is great for jelly, wine, or in a spritzer. Last year I made chokecherry/pear jelly but I'm open to suggestions for this year's crop. I'm always nervous when I forage in the park. I'm not hurting anyone by picking a few berries, but park rangers have ticket quotas to fill and I never expect anyone to be reasonable. So I try to stay off the beaten track, but this fruit bonanza was close to a major thoroughfare. I furtively picked about a cup of fruit, then slunk off, hoping to find another tree in a more secluded part of the park. Sadly, I didn't, and the thought of that heavily-laden black cherry in the almost public spot haunts me. 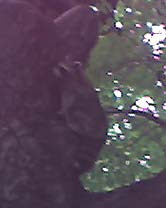 As I left, I spotted a raccoon 15 feet up in a nearby tree (a raccoon...in NYC). I hope he leaves a few cherries for me, because I'm going back for more. Should they go to waste?